Printing companies can dispose all old D50 neon lights and other light sources that do not meet the new D50 specifications of 2009 with higher UV components. All lenses and diffusors of the neon tubes should be observed critically, as they could possibly contain UV filters and therefore block the newly added UV light spectrums. If you have X-Rite i1 or EFI 1000 Spectrophotometers, or even the classic Epson SpectroProofer ILS 20 installed, you have to exchange these measuring devices with new ones. Old devices, that can only measure M0 or UV-Cut are not capable to measure Fogra51 and Fogra52 or GRACoL and SWOP 2013 Standards. Up to now, there has been no was developed to convert the old i1 devices somehow by firmware upgrade to measuring a kind of “calculated M1”. Who is still producing digital proofs with software from 2003 or so will need to get a system upgrade to the latest software version. Only current software releases are capable to address he new measuring techniques and devices. Updating the software might be the most expensive part in upgrading to M1. The new necessary proofing papers will contain optical brighteners, the so called OBAs and sometimes cost noticeably more than the old proofing papers. We expect that for quite some time there will be a coexistance of both standards, ISOcoatedv2 and PSOCoatedV3. Speaking of uncoated proofing papers: At present, everybody is unhappy with the existing PSUncoated standard – so it is expected to be replaced directly by the new PSOUncoatedV3 standard. With the new standards, the old, film-based tone value increase curves are unified and equalized from CMY to K to a value. So CTP machines will need to have some service staff to implement the new curves in the RIP computer that controls the CtP platesetter. Certainly, old customer will call and placed repeat orders: “The colors exactly as last time, all right?”. Certainly, you can’t blame your customer to do so. Therefore, a workflow or software transforming ISOcoatedv2 customer data to your new standard … via GMG ColorServer or device link profiles with PDF Toolbox et cetera will be important. The new standards will come, so changes are sooner or later inevitable. The changes will be significant, but for most companies as well manageable. In some areas, such as the printing on uncoated paper, the upcoming changes will directly lead to noticeably better results, for example in terms of proof-to-print match. For coated paper – ISOcoatedv2 – it remains to be seen how quickly the changes will take place. We expect Print shops to be certified during a transitional period of one year for the old or the new standards PSO. We of the Proof GmbH have prepared for the changes at least half a year ago, and can say: Yes, there is a considerable effort. Nearly a month revenues investments. And a high intellectual invest dealing with the topic: “What we have done so far, and what we will do in the future?” “How will we advise our customers on how they separate and proof data?”. “What is better with the new standards, what is just different?”. 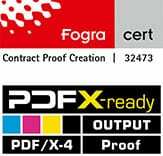 Currently our Fogra certification is running out after one year, but it makes no sense at present to be today certified for PSOUncoated, only to be certified in three weeks for PSOUncoatedV3 again. With the kick-off at the 30th of September, there is at least a specific date for the start of the new printing conditions. Whether we will actually see the new conditions then, and if a certification to the new printing conditions will be possible immediately, we currently do not know. At the end of September, we will certainly know more. This entry was posted in Basics, Gamut and Color Profiles, Proof Paper and Substrates, Proof Software and Technology, Prozessstandard Offsetdruck and tagged bvdm, ECI, Fogra, Fogra 51, Fogra 52, Fogra51, Fogra52, GRACoL, GRACol 2013, IDEAlliance, Proof GmbH, PSOCoatedV3, PSOUncoatedV3, SWOP, SWOP 2013 by Matthias Betz. Bookmark the permalink.